How do I choose a fabric? I'm so very excited about this collaboration! 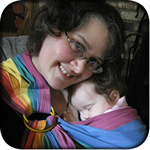 I'd been wanting a rainbow ring sling again for several years -- it's what I think of as my signature sling -- and when Alisa from Tekhni Wovens said she'd work with me on one, I jumped at the chance. For Spectrum and Terra, the design is of stylized DNA strands, each a little different from the next. DNA means many things to me: my degree is in biology, and I started babywearing because it enabled me to parent in a way that made the most biological sense. Our DNA is a continuous link not just to our ancestors, but to all of life on Earth. It makes us unique, but it also joins us to each other. It makes us a family regardless of direct genetic relationships. Of course, since I've been making ring slings since 2001 and my youngest child was born in 2007, I no longer have any babies to wear. If you're in the same boat but still love this fabric, here's your winter scarf sorted! The fabric is a jacquard woven with a 55% cotton and 45% Repreve blend. Repreve is made from 100% recycled water bottles. It's very strong and durable, and adds a cushiness to the fabric similar to wool, without the itchiness -- a fantastic addition to your winter accessories. At the same time, it's not so warm that you couldn't wear it in the fall and spring as well. You can read more about Repreve on Tekhni's blog. If, like me, you have no more babies to wear but still love the stripes and DNA of this Tekhni exclusive woven, this is your new winter scarf! Brighten up the darker days with Spectrum's sunny gradient. If, like me, you have no more babies to wear but still love the stripes and DNA of this Tekhni exclusive woven, this is your new winter scarf! Accessorize your neutrals with some DNA. All content is (c) 2001-2018 to Jan Heirtzler/Sleeping Baby Productions LLC and may not be reproduced without permission. Logo design by Molly Fisher, Fisher Illustration and Design.